Did you know that HHH has fed over 1,500,000 servings of protein to those in need since the program began 18 years ago? HHH is COMPLETELY volunteer and all money raised goes to pay to process vension for the food bank system in New Jersey. If you would like to donate this holiday season, please send your donation to HHH, P.O. Box 587, Lebanon, NJ 08833. THANK YOU! Thank you to the family of John McMahon,they raised $2,290 for Hunters Helping the Hungry during the “Celebration of Life – John McMahon” event! For the past several years, Cabela’s in Hamburg, PA has allowed volunteers from Hunters Helping the Hungry to set up an information table around the holidays. This year trustees, Bud Thomas and Mark Charbonneau spent the day on 12/21/13 talking to lots of great people. Bud and Mark felt really proud of the efforts of all the HHH volunteers when many folks who visited had positive comments about what HHH does. Mark Charbonneau noticed that this year seemed to have more and longer conversations with supporters. He said that after discussing what we do, why we do it, and of course how we do it; customers took the time to make additional comments such as “God Bless You,” “Good for you guys,” “God be with you,” “Merry Christmas,” “Bless you,” etc. These comments certainly help to energize the volunteers this deer hunting season and all of 2014. HHH collected over $400 in donations that day. All of which helps HHH continue to put venison on the tables of those who are in need in New Jersey. Hunters Helping the Hungry, a nonprofit organization founded by two Hunterdon men, reports two successful fundraising events in May — a clay-bird shoot in Coplay, Pa., that netted more than $3,300 and a striper-fishing trip that pulled in more than $1,000. HHH is a statewide organization, but most of its trustees are from Hunterdon. It invites hunters to donate their deer, which are butchered and the meat is distributed to the needy via organizations such as NORWESCAP and Catholic Charities. A hunter donating a carcass also donates $10 toward butchering, but even at discounted prices, it costs $65 to cut up a deer. So HHH relies on donations and fundraising events. The May 6 clay-bird shoot drew representation from the Hunterdon Hills Friends of NRA Chapter, New Jersey Federation of Sportman’s Clubs, Croton Rod and Gun Club, Editor Chris Lido from the Fisherman Magazine and Gals Gone Gun. The North American Hunting Club 2011 Mentor of the Year John Clites showed up from western Pennsylvania bringing a foursome with him. 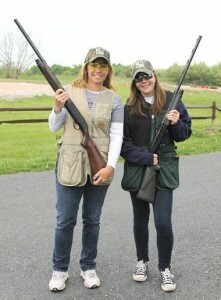 The next HHH clay-bird shoot will take place at Lehigh Valley Sporting Clays in Coplay on Sept. 30. Check the website huntershelpingthehungry.org in the coming months for registration instructions or call Charbonneau at 908-447-8470 to sign up.